This site is an informational resource with the goal of outlining and educating builders, contractors and homeowners about the fundamentals of foundation waterproofing. The site also aims to correct the many myths and poor ideas that surround the subject of waterproofing and the causes of basement flooding. Below is an explanation of the different stages involved in the building of a modern (last 100 years) home. First a footer is poured and dried before the walls can be either poured, or set (as with masonry block). Once the footer is thoroughly dried (cured) then the walls may be be set on top of them. Here is the first real problem. The fresh wet concrete walls will not adhere entirely to the now dried footer. This creates a seam that runs the whole length of the bottom of the wall where it sits on the footer. When this seam is then buried 2 or more feet below ground (as you can see it will be in the image above) it leaks very easily. Seeing the depth of the hole above, you can easily see how deep the basement floor will actually be. The basement floor is poured so that its edges end at the wall right on top of the footer. Given enough rain there will be a large amount of water in that hole even after the hole is back filled. 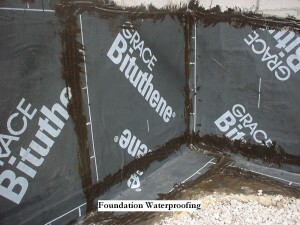 Below are images of exterior waterproofing solutions. Water (the second smallest molecule in the world) simply skirts around the membrane finding any small opening to enter. It only takes one. Of course water will not penetrate these materials but the problem is these materials are not without seams. Notice how each membrane is in sections? Water easily finds a route to enter such systems. 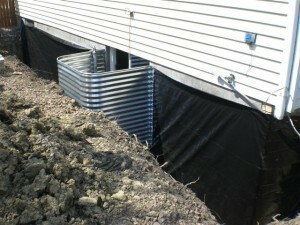 When these materials and foundation wall itself become wet it compromises the materials used to adhere it. Once they come loose in just one spot the whole system becomes a giant bag of water that stores water long after the rain water is gone. This is often why so many homes are leaking long after the rain is gone. Moving earth contributes heavily to the failure of these systems. If you look at exterior drainage pipes, consider that the weight of a square foot of wet dirt is about 114 lbs. or more. An 8 ft. high wall and a section of that 3 ft. wide by 3 ft deep that would come to 8,208 lbs, or about two pickup trucks filled to capacity. The drainage pipes at the bottom of the wall cannot handle this for very long. They are almost always overrun with mud and silt in just a few years. It is not only water and mud standing outside the wall that is the problem. As the rains increase and water rises from beneath the waters hydrostatic pressure (this is waters upward pressure) causes it to rise up beneath the footer, and behind any materials used to waterproof the wall. Now these materials only serve to prevent the wall from drying naturally. Each situation is different, but luckily all the causes are the same. First, and sadly for some, basement floors should not be more that 4 or 5 feet under ground (especially if the whole basement is subterranean). And especially if the area has a tendency to gather water or is located in a lower section of land. If the basement is shallow, say 3 ft then the building of an outside swale (photo below) to the depth of about 2.5 feet and running the course of the problem area should suffice. Although it is not likely that any experienced contractor would warranty any exterior work. Sometimes you can just use your best judgment in this case. At that depth there is more water and typically more sudden water movement. Meaning that a swale would either get quickly clogged or get immediately overrun. The exterior drainage would have to be both very substantial and at least next to the footer (9 ft. for an 8 ft. deep basement). Why the extra foot deeper just because in am 8 ft. deep and not 3 ft. deep? Because at that depth the sudden rush of water in a severe rain wont immediately drain down and will back up. By having the drainage lower, you are thereby lowering the lower threshold by a very important foot. At a depth of more than 4 ft. the only guaranteed solution would be an interior water pressure sub-floor system with an interior vapor barrier on the walls running into the sub-floor system. Even though the IBC (International Building Code) does not recognize interior systems as adequate to prevent structural damage keep in mind that exterior systems trap water in the wall if membranes are used which also deteriorates the wall. At least with interior systems the wall actually gets to completely dry.